Fixes various issues in Mass Effect: Andromeda left unresolved by the developers. Frosty Mod Manager Created using Frosty Editor 1.0.4.5. Older versions may cause the game to freeze either on the initial loadscreen or when loading certain areas. - Holding down the power button to grab enemies with pull won't cause them to drop to the ground anymore. - Fixed one of Annea's mercs running through the room during the cutscene that starts after scanning the artifact in the lake, during the quest "Water Supply". - The water merchant at the paradise, on Elaaden, will only appear if Annea is still in charge. - Stopped Astra from following the player when loading a save or returning to the area, during the quest "Brought to Light". - Fixed permanent unread mark on the journal caused by the quest "Cora Harper: A Foundation". - Stopped conversation with Jun-Seo Park, the teacher at Prodromos, from repeating. - Stopped the reconstructed conversation in Resilience, on Eos, from repeating every time the room is scanned. - Prevented dialogue about the kett, during "Jaal Ama Darav: Friend or Foe? ", from being played twice. - Fixed Sid's dialogue being unavailable after starting the quest "Life on the Frontier". - Stopped the conversation about the temperature decrease on Elaaden from repeating every time you return to the paradise after activating the vault. - Squadmates won't comment on the water tanks at the paradise, on Elaaden, if the source of the water has already been found. - Stopped Ryder's comments about false signals from the quest "Cora Harper: Asari Ark" after the transponder has been found. - Stopped conversation between Addison and Spender from repeating every time you go near her. - Fixed people on the nexus acting as if the angaran delegation was already there if you go there after rescuing the Moshae but before visiting Aya. - Fixed dialogue being played when approaching the kett base on Voeld. - Fixed dialogue from "Something in the Water" playing when entering Charibdys Point on Kadara after the quest was completed. - Fixed Ryder's head getting tilted when listening to the datapad on a platform of the watchtower in front of the cave entrance at Draullir (the cave where the Collective's base is). - Changed camera angles in the conversation with Annea, during the quest "Water Supply" so the view isn't obstructed by Ryder's shoulder. - Stopped dialogue being played when approaching Erosek, on Voeld, from repeating. - Changed platinum requirement for the tier 3 pathfinder chest piece from 10 to 20, so the progression is now 20>20>20>30>30>30>30>40>40>40 instead of 20>20>10>30>30>30>30>40>40>40. - Task: Earn Your Badge; killing the remnant destroyer too fast will no longer prevent the last few remnant from spawning. - Brought to Light; loading a save at the stage "Speak to Astra", after defeating the first wave of kett, will no longer cause the quest to get stuck. - Fixed a bug in Pull that could prevent enemies it was used on to be targeted by Charge and Avenger Strike. - Fixed being unable to scan the maintenance panel in Pathfinder HQ during the quest "Station Sabotage". - Removed leg armor from the asari scientist from the quest "Overgrown" on Harval since it was badly clipping through her uniform. - Fixed permanent unread mark on the journal caused by certain quests. Fixed quests are "Task: Data Trail", "Task: Catch and Release", "Task: Clearing the Air", "Task: Gone Dark", "Task: Cold Hard Cache", "Task: Kadara's Ransom", "Task: Cache Flow", "Task: Little Mouse", "Task: Infection" and "Task: Volatile". - Fixed permanent unread mark on "Scourge" codex entry. - Fixed Ryder's neck getting twisted in conversation with Harry in the Cryo Bay. - Fixed one of the exiles' neck getting twisted in an ambient conversation in Kadara Port. - Fixed head angles on some lines in Reyes' dance scene with male Ryder. - Added missing plot-checks to the conversation with Bain Massani to properly reflect whether or not the kett base has been taken out yet. - Prevented dialogue from the quest "Kett's Bane" from playing when approaching the kett barracks before talking to Bain. - Fixed carbon pattern being applied to the female versions of the Heleus helmet. - A Job for Danny Messier; the bugs from wildlife encounter won't re-spawn and the map marker will disappear once the encounter is completed. - A Dying Planet; prevented Zorai's remains to be scanned before listening to the audio log since the dialogue doesn't make sense otherwise. - Changed gender of multiple turians at the Paradise, on Elaaden, to match their voice sets. - Changed gender of multiple krogan in New Tuchanka to match their voice sets. - Tech Danny Messier will now actually leave the outpost on Eos. - Prevented enemies at the kett outposts on Voeld and Eos from respawning once the outpost has been cleared. - Added missing picture to the journal entry for "Save Dr. Okeer's Krogan Research". - During "Investigate Remnant Derelict", the door to the drive core is now open during the cutscene discussing the theft. - Fixed Ryder's neck getting twisted in conversations with Jaal at the Cultural Center and the Ancient AI in SAM Node. - Addison now looks at Ryder during the conversation when establishing an outpost on Kadara. - Fixed the shell filaments required to craft the tier 10 Isharay. - Fixed the Pathfinder Ranger being craftable with an automatic fire type augment instead of single fire type. - Fixed Tempest store restocking to tier 1 gear when loading a save in the research room. - Task: Cold Hard Cache; prevented the objectives "Defeat the outlaws" and "Prevent the shuttle from leaving Kadara" from being triggered too early, which caused the objective "Travel to the navpoint" to get stuck in the journal. - Fixed red outline on enemies from the infiltrator perk remaining permanent if they are killed while it is active. - During "Task: Cold Hard Cache", there will be no invisible leftovers of the shuttle after it was destroyed. - Fixed remnant container during "Task: Cache Flow" having both the interface and loot option enabled by default. - Fixed the doors to Peebee's and Jien Garson's apartments not getting locked again post mission completion. - Changed gender of one of the turians in the Vortex bar on the Nexus to match his voice. 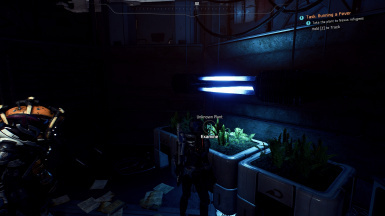 - Moved the turian and asari in Operations, discussing if its safe to go to Eos, out of the ground. - Moved a sleeping colonist on Eos that was clipping into a bed. - Nilken, from the quest "First Murderer", no longer sits on Fisher's lap in the Hyperion cryo bay, when requesting to be put back in stasis, if the quest is finished before establishing the outpost on Eos. - The bald scientist in Christmas Tate's room, on Kadara, no longer appears twice. - Moved two NPCs in the outpost on Kadara further apart so they no longer clip into each other. - When landing on Eos for the first time Liam will no longer spend the landing cutscene invading Ryder's personal space if you don't have him in your squad. - Applied the correct volume and voice filter to Ryder's segments in the HNS broadcasts and stopped him/her from speaking the lines. - Fixed missing audio for SAM's lines in banter between Jaal, Cora and SAM about AIs in the Milky Way and in banter between Jaal and Drack about SAM. - Vorn will no longer say that the vault being active makes his work easier if the vault isn't active yet. - During "Something in the Water" Ryder won't comment on the filtration centre, wondering why they would drink poisoned water, if the filter was already scanned. - Vetra Nyx: Means and Ends; the Hydra mech in the workshop can now be scanned and disabled. - Fixed target seeking properties of the Silhesh. - Weapons with a vintage heat sink will no longer cause spare ammo of other weapons to be set to 0 after certain cutscenes. - The maintenance panel in Pathfinder HQ will stop emitting sparks once the outpost on Eos is established. - The bed in Christmas Tate's room on the outpost on Kadara is now static and won't move around when bumped into. - The Pathfinder Pioneer can now be crafted with the automatic fire type augmentation. - Mind Games; fixed door leading to the scientists not opening. - The asari trying to convince her turian friend to return to Eos will no longer appear if you already talked to them. - The engineer from the quest "Task: Broken Wires" will no longer appear after the quest is completed. - The medic from the quest "Task: An Exile Raid" will only appear once Elaaden is accessible and disappear again once the quest is completed. - Changed gender of one of the Mithrava Sages to match his voice. - Fixed "more impulsive on the field" entry always displaying in Ryder's psychological profile. - The "more impulsive on the field" and "more impulsive with personal affections" entries in Ryder's psychological profile will also only display if your character actually is impulsive. - Fixed Vetra referring to a custom named female character as "Sara" in her ambient dialogue on Aya if she was romanced. - Fixed Cora referring to a custom named male character as "Scott" in her ambient dialogue on Aya if she was romanced. - Fixed multiple plot-flag errors in the immigration scene for the asari colonists. - The conversation with Kandros' Lieutenant for the quest "Aid Apex" no longer repeats. - Linked up the conversation for "Task: Outpost Supplies" properly. - The dialogue when approaching the scavenger hideout from the quest "Safe Journeys" will no longer repeat every time you enter the area. - The dialogue about the ark escape pod on Eos will no longer repeat every time you go through the cave. - Yale no longer greets the Pathfinder with "sorry it came to this" even though the connected questline "Life on the Frontier" hasn't even begun. - When you walk up on Buxil in Techiix the conversation about Nilj's Escape from the Kett no longer plays if he hasn't been freed yet. - Fixed tier values on the pathfinder weapon blueprints. - Fixed tier 9 and 10 Maverick Arms blueprints being called Remnant Heritage Arms. - Fixed icon on tier 9 Initiative Arms blueprint. - The blueprint for the cybernetic device from the quest "The Firefighters" now shows the device rather than an armor piece. - The blueprint from the quest "Task: Shield Crafting" no longer gets stuck in the crafting menu if you already have the upgrade before receiving the quest. - Stopped flickering that occurred on some visual effects when effect quality is set to ultra. - Added missing explosion effect when overloading the lower platform during "Remove the Heart". - The items for the "Movie Night" questline will no longer appear in the merchants inventory after you bought them. - The blueprint for the cybernetic device from the quest "The Firefighters" will no longer get added to the inventory every time you talk to Alain on Kadara. - Purchasable ship models no longer show up in the inventory. - Mind Games; fixed a bug that could cause the quest to become stuck in the journal. - Truth and Trespass; scavengers no longer re-spawn endlessly when moving around the quest area during the stage "Defeat the Scavengers". - Dissension in Ranks; the conversation with the Primus will no longer skip if you have two team-mates with you that would accept the deal (Cora, Peebee and Vetra). - Task: Shield Crafting; The quest will no longer auto-complete and remove the blueprint when entering the Tempest or accessing the vehicle store on the Nexus, making it impossible to craft it. - Fixed Remnant VI not getting dismissed when it is active at the end of a mission that automatically sends you back to the Tempest. - Jaal's Avenger Strike is now properly considered a melee attack. - Fixed Jaal's Avanger Strike and Sticky Grenade being listed as Tech Powers. - Fixed Warp rank 5 "Expose" defense debuff not being applied. - Fixed Recon Visor being considered a Combat Power. 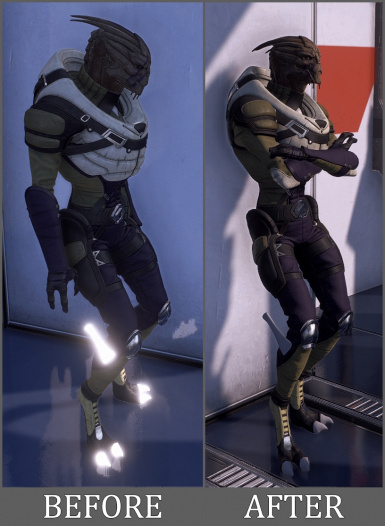 - One of the turian colonists that show up on the Nexus after finding the Natanus had wrong materials assigned to his feet, causing them to glow. - The dialogue prompting you to scan the body at the entrance of Site 2: Resilience will no longer repeat once you scanned it. - Fixed multiple issues with incorrectly timed, missing and repeating dialogue during "Remove the Heart". - Remove the Heart; fixed an issue that could cause the hangar bay door to become stuck permanently closed, making it impossible to complete the quest. - Remove the Heart; the elevator to the tower will no longer become unusable when leaving the area without deactivating the base. - Remove the Heart; stopped the doors leading to the hangar from locking behind you after the base is cleared. - Task: Running a Fever; quest can now be completed. 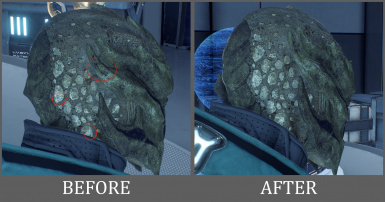 - fixed multiple texture seams on turian females. Use this only with version 1.10 of the game. Using it with older versions will cause the game to freeze on the initial loadscreen. Fixes various issues in Mass Effect: Andromeda left unresolved by the developers. If you know of any bugs that have not been fixed yet please report them in as much detail as possible and I'll see if I can come up with a fix. Unless mentioned otherwise all fixes work retroactively. If you have started the quest "Task: Gone Dark" before installing version 1.03 I recommend finishing the stage "Locate and scan Resistance bugs in kett camps" before installing this. Check the changelog for fixes included in previous versions. If you use my Multiplayer Powers in Singleplayer mod load it after this mod. Some fixes require multiple files to work, if another mod overwrites only part of the fix it may leave the game pointing at records that no longer exist, causing it to freeze or crash. If you experience any issues check your load order for conflicts. Thanks to Ehamloptiran (GalaxyMan) for the Frosty Tool Suite. Also thanks to everyone that reported bugs.